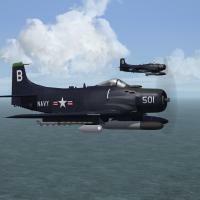 The mod represents AD-4B Skyraiders during the Korean War. It should be noted, the -4B was equipped for "special weapons delivery", and was the primary type the USN had for this at the time. Of course, it carries all the conventional munitions as well, so standard mission tasking remains. 2 special loadouts are available through the 3W mission editor (see "Notes" for more details). 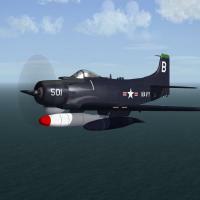 The aircraft is finished is standard 1950s Dark Gloss Navy Blue. The skin is in jpg format. All markings are decals, excepting the green squadron color on the tail fin. Decal randomization is TRUE. The BuNums, while correct for this model, are not specific to any squadron, and should be considerd 'generic' in nature. Wingfold and canopy are controled via the Standard Animiation Keystrokes . Shift/9 for the wings, and Shift/0 for the window. Most weapons are suppllied, including the low-yeild (8 kt) "special". The nuke effects are from the Gunny Pak, and I HOPE I've got all the pieces/parts in place; if not, you'll have to locate them yourselves from the Gunny Pak (or just intall the Effects from there). The other weapons used can be found in the KAW weapons pack. To differentiate it from the other -4s. The "3W" indicates use of the stock 3W lod. As always, fairly easy to follow, detailed install instructions are included. So, please read them ....In fact, read them before installing, but after unzipping of course! This mostly pertains the effects used for the 'special weapon'.